Luis Anibal Rodriguez, 63, of Woodbine NJ passed away on Monday October 1, 2018, of complications resulting from cancer. Luis was born October 3, 1954 in Maricao, Puerto Rico to Guillermo Rodriguez. and Maria Irizarry (Benigna Segarra, married name). He started his elementary learning in the public schools of Maricao, Puerto Rico. He was 14 years old when he moved with his family to Woodbine NJ. Although young, he understood the importance of earning a living. He met the original owners of the Colorado Café in Woodbine. There he would work after school and be loved and treated as though he was their very own son. Having an independent free spirit, soon after he would move to Millville NJ and then on to New York in search of other work opportunities. It wasn't until years later, In June of 1991 at the age of 36, he received a High School Equivalency Diploma from The University of the State of New York. On the streets of New York, life took some tough turns for Luis but, he would eventually find comfort in the Word of God. From July 1985 through August 1991 he took various courses in biblical study and used the knowledge he gained in a powerful prison ministry of 14 years affecting the lives of many men in several states. During that time, he also got baptized (September 1990), and took a course in welding for which he received a certificate of achievement as well (June 1988). Luis loved his mother dearly. He remembered the sacrifices she made to raise the family and the bible she gave him in his most difficult moments. He remembered her telling him that all the answers to the questions he had would be found in it. He used it to the end of his days, reading from it often right before going to bed. He would also mention that he wanted that bible in the casket with him upon his death. As his life continued, He went back to Maricao, Puerto Rico and from 1996 through 2004, he worked mostly in construction and/or maintenance. He loved coffee and it may have stemmed from his love of the coffee festivals held in the town of his birth. However, he did return to Woodbine, and after a couple of years began working for the Borough of Woodbine. There he would eventually meet his wife. He was a fun-loving very social man that never missed an opportunity for a fun time with family and friends. He was drawn to people who like to laugh. And what can be said of his love for his Philadelphia Eagles Football Team? He had a T-Shirt that read, "Win, Lose, or Tie, I am an Eagles Fan Until I Die." That was him through and through, a die-hard fan. You could not trash talk his team in front of him, because that compassionate family loving man, would say, "Get out of my face!" His other past times were playing dominoes, chess, and working in his backyard. He sure did love sitting in his yard or on his porch, grateful to the Lord for what had been given to him in these later years. He is survived by his wife Monserrate Gallardo-Rodriguez, four (4) years together, married for 1 ½ of those years, his six (6) children from two (2) previous relationships, Luis Anibal Rodriguez Jr., Michael C. Rodriguez, Lourdes Rodriguez, Angel Luis Rodriguez, Brenda Rodriguez, and Jose Aguilar, as well as, his two (2) children by marriage, Cassandra E. Lebron, and John E. Rivera. He is also survived by his mother (previously mentioned above); Eleven (11) brothers and sisters, Eddie Ramirez, Nancy Rodriguez, Norberto Rodriguez, William Rodriguez, Ida Rodriguez (Cuca), Anace Rios, Gladys Rodriguez, Angel Luis Rodriguez, Emilio Segarra, Neftali Segarra, and Elvis Segarra, and many loving nieces, nephews, cousins, and grandchildren too numerous to mention. 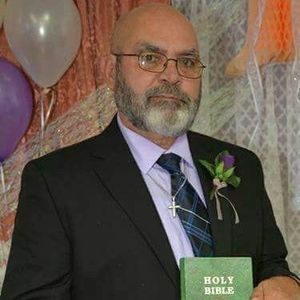 A celebration of the life of Luis Anibal Rodriguez will take place at Horne's Temple Lighthouse Deliverance Ministries Church of Woodbine, NJ on Saturday October 6, 2018. The viewing for family and friends will begin at 10:00 am followed by services at or after 11:00 am which will then be followed by a trip to the Head of the River Cemetery, Tuckahoe NJ area. He was very loved and will be missed but it's not a goodbye…just a see you later. The beautiful and interactive Eternal Tribute tells Luis' life story the way it deserves to be told in words, pictures and video. What a wonderful life of love, caring and Light you brought to your family & all those that love you. May the memories of love, laughter, joy and The Word of God fill their hearts everytime you are brought to mind. May a gentle smile touch their hearts & lips at the thought of you, even in this time of sadness.